In the past, a patient suffering from disc problems was usually given pain medications, instructed to refrain from physical activities, referred for physical therapy, and when they weren't progressing they were sent for spinal surgery. 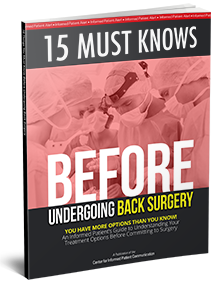 Conservative chiropractic care proved very helpful in many cases, yet there have been some cases when surgery seemed to be the only other option... until now. Today, you dont have to live with that pain anymore. 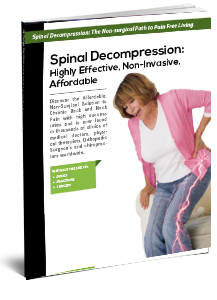 Thanks to the concerted efforts of a team of top physicians and medical engineers, Spinal Decompression Therapy was developed to effectively treat lower back pain and sciatica resulting from herniated or degenerated discs. Spinal Decompression Therapy not only significantly reduces back pain in many patients, but also enables the majority of patients to return to more active lifestyles. Data from a recent multi-center pilot study utilizing Axiom Worldwides DRX9000 Reveals a Dramatic Success Rate of 88.9%!